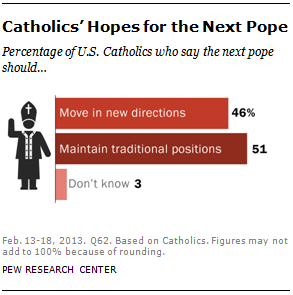 As the process gets underway for selection of a new pope, many American Catholics express a desire for change. For example, most U.S. Catholics say it would be good if the next pope allows priests to marry. And fully six-in-ten Catholics say it would be good if the next pope hails from a developing region, such as South America, Asia or Africa. Among Catholics who say they attend Mass at least once a week, nearly two-thirds (63%) say the new pope should maintain the traditional positions of the church, while about one-third (35%) say the new pope should move the church in new directions. By contrast, among those who attend Mass less often, 54% say the next pope should move in new directions while 42% prefer to maintain the church’s traditional positions.